display consumption, tariff and other information. 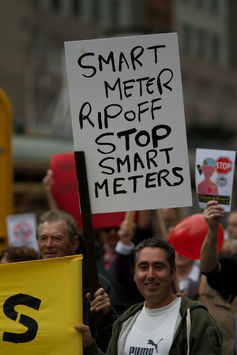 Smart meters are not an end in themselves. But they can be a way to develop a more effective “demand side” in the electricity system; right now, most of the control of electricity delivery comes from the “supply side”. At the moment, most power users get a flat tariff, whatever time they’re using power and however much demand there is for it. Smart meters can be used by power companies to introduce time of use tariffs – that is, to charge based on how much demand there is for power at a particular time. If accompanied by good feedback (such as an in-home display), they can allow consumers to control when they use their power, thus controlling what they spend. Smart meters can also improve billing systems and bring other benefits. Costs in the electricity system (and hence impacts on customers’ electricity bills) are driven both by overall demand (the total amount of electricity consumed) and peak demand (the maximum amount consumed at any one time). Peak demand is a particularly important driver of costs. Energy companies have to build power stations and networks to serve demand for only a small number of hours of peak demand each year, which means that this infrastructure is effectively unused for much of the time. Yet the companies who have built it will still need to recover the high fixed costs. The Australian Government estimates that 25% of retail electricity costs are derived from peak events – such as hot weather – that occur over a period of less than 40 hours per year. The rapid growth of peak demand relative to overall (or average) demand has been a major factor influencing costs in the Australian electricity system. Between 2005 and 2011, peak demand increased at a rate of approximately 1.8% a year, while total electricity usage grew at 0.5% a year. Although peak demand has fallen more recently this may just be due to cooler summers (and hence less use of air-conditioning). It is rather soon to say whether this drop off is a trend. Tackling peak demand could help reduce the growth in costs. However, that there are many factors to consider in assessing whether reducing peak demand will in fact reduce costs – notably whether there is scope to defer or avoid investment. In some areas, where much investment has been made in recent years, the scope for savings may be limited. Smart meters can deliver information, technology solutions and price signals, such as time of use and critical peak tariffs or rebates. They could therefore enable consumers to provide demand response in the electricity market. They could do this by electing to use less power when power is expensive. Many time of use trials have found that the biggest reduction in peak demand comes from a combination of price signals, automated control (so consumers don’t have to do all the work to benefit from reducing demand at peak times) and clear, simple information. Some sources say the Prime Minister is likely to propose the AEMC recommendation that smaller consumers be allowed to stay on a flat tariff when they get a smart meter, rather than being charged based on the time they are using power. This would help protect low income and vulnerable consumers from the risk of a bill shock. It would be good practice for consumers to have a smart meter for some time before being offered a time-of-use tariff, so that they can build up a picture of their consumption (load) profile and then work out whether a time-of-use tariff would be the right choice for them. Consumers also need ways of accessing information on their usage. A meter on its own will not do this; customers also need in home displays or web portals and these should be provided at the same time or soon after the meter has been installed. In the UK, the Government requires the energy retailers (who are responsible for the roll-out) to provide every consumer with a free in-home display at the same time as their smart meter is installed – and the installer will also show the consumer how to use it. Smart meter roll-outs can be costly however and costs may escalate beyond original estimates – as was the experience in Victoria. It certainly makes sense to undertake robust cost and benefit assessments for any major change in energy markets – including smart meter roll-outs. There are pros and cons of all forms of roll-outs. Network led geographic roll-outs may offer economies of scale but retailer led roll-outs may allow for more effective targeting of smart meters (for example, large users could get meters first). Whoever rolls out smart meters however, it is the consumer who will pay the costs. Consumers, therefore, should see some benefits. Gill Owen does not work for, consult to, own shares in or receive funding from any company or organisation that would benefit from this article, and has no relevant affiliations.